That question to readers of the University of Queensland’s website. Old Mr Anorak suggests a) a longbow; b) Victoria Beckham (in heels); c) an exploding mongoose. 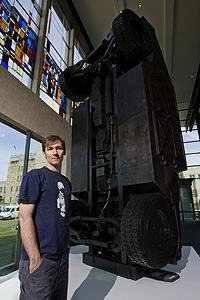 My Humvee (inversion therapy), a monumental sculpture by Peter Hennessey which is the latest acquisition by the UQ Art Museum and is now on show to the public. Carved out of black painted plywood and standing permanently in the museum foyer, the piece resembles a tower which on closer inspection becomes a model of the gas-guzzling car tipped on its nose. It’s genius. And much, much, much better and more arty than buying an old Humvee and standing it on its nose.